ITIL is the result of the UK government’s Cabinet Office documenting a set of processes and procedures for the delivery and support of high quality IT services, designed and managed to meet the needs of an organization. Good e-Learning provide certified ITIL training from ITIL Foundation level, right the way through to Expert. Our courses will teach you how the ITIL best practice framework can be used to improve the quality, effectiveness and efficiency of service management in every type of organization. The ITIL qualification structure provides a modular approach to the ITIL framework, and is comprised of a series of qualifications focused on different aspects of ITIL best practice to various degrees of depth and detail. The tiered structure of the qualification offers candidates flexibility relating to the different disciplines and areas of ITIL and the ability to focus their studies on key areas of interest. The diagrams below illustrate the breakdown of the ITIL qualifications and credits available that will support and provide you with the information required for individuals and organizations with the ITIL service management practices. By completing the ITIL Foundation course, you will gain an understanding of the importance of service management, both to the IT service provider, and to its customers. ITIL Intermediate qualifications are the next stage. They have a modular structure with each level providing a different focus on IT Service Management. To ensure that you gain the best possible outcome and a wide range of knowledge within ITIL qualifications across the curriculum, certain prerequisites and mandatory credits are required. We recommend that if you aim to achieve your ITIL Expert qualification you must gain a well-rounded knowledge of ITIL. To ensure that you achieve this you should select a variety of Intermediate modules which complement each other. 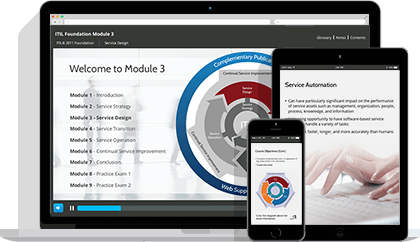 When selecting your Intermediate modules of study they should cover each of the 5 practice areas which will give you the knowledge required of the full ITIL best practices. The scheme has been designed with two principles the service lifecycle and capability. The two streams have been developed to provide you with a balanced coverage of the ITIL principles. 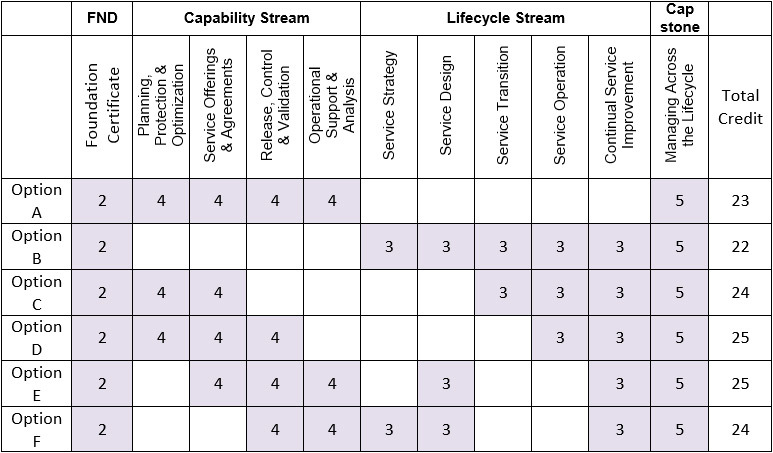 There are other routes to ITIL expert which offer a similar balance and some possible combinations are show in the table below. It is not a mandatory requirement that you should choose one of the options below although selecting one of these options will give you the best possible outcome, knowledge and skills base within ITIL. All of our ITIL courses have been accredited by EXIN, who are licensed by AXELOS as an Examination Institute for the ITIL® Foundation, Intermediate, & Expert Certificates in IT Service Management.